2018 Standard Bank KZN Top Business Awards. These awards aim to celebrate local brands that have grown within the KZN community and contribute to the province's continued success. We're honoured to have won this accolade and to be recognised among businesses that are excelling in their respective fields. 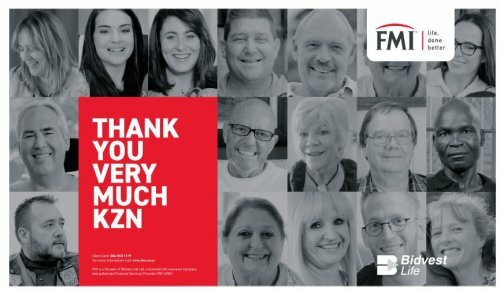 We appreciate the immense support we've received from our policyholders, staff members and independent advisers countrywide. We're a specialised life insurance company, with our focus being on income insurance. Our business is built on being able to step in when your life is affected by an injury, illness or death by providing a monthly income when you're unable to work. That means that every time we pay a claim we're helping you provide for yourself and your family, or to keep your business running. We have a unique set of income benefits that are designed to mimic your monthly income stream to pay for day-to-day expenses like groceries, electricity and education. Our lump sum benefits, on the other hand, are designed to allow for any once-off expenses that arise when adjusting to a permanent disability, a critical illness, or the passing of a loved one. We believe the best way to protect your monthly income is with a combination of these benefits. of their dreams, despite the curveballs life throws at them. difference we can make. Search for #21Lives on social media to watch some of our powerful, real-life claims stories. We want to humanise insurance. We believe that everyone is writing their story. We step in to provide you with your monthly income when you need it most so that you're able to continue to write the rest of your story - your future. We truly care about our policyholders and treat them like family. We're brave enough to challenge the norms, and we're innovative, offering more than what our customers think possible. Here's to our brave clients, committed advisers and passionate staff; and to growing vigorously while continuing to make a real difference in people's lives!